The agreement, he said, cemented Greece’s status as a “leading power” in the Balkans and as a “pillar of stability”. His counterpart in Skopje hailed the agreement as "historic". "We have been solving a two-and-a-half decade dispute... that has been drowning the country," said Zoran Zaev, whose election in 2016 presented a new opportunity to solve the long-running issue. Zaev added that the deal, "will strengthen Macedonian identity." Greece and the former Yugoslav Macedonia have not attempted to resolve their dispute since 1995. The conservative VMRO-DPMNE party, which has ruled since 2006, followed a confrontational policy with the Greeks. The Zaev government’s election in December 2016 presented a new opportunity. Talks began in January on the basis that Greece would allow use of the word Macedonia, and the government in Skopje would choose a qualifier, to differentiate the country’s name from the Greek province of Macedonia. If all goes well, the European Union’s foreign ministers, who meet at the General Affairs Council on June 25, will decide whether to issue the former Yugoslav republic an invitation to join the European Union. NATO would then, in theory, issue its own invitation at the upcoming annual summit on July 11-12. The two invitations would lend credibility to the government of Zoran Zaev, as it appeals to the country’s 1.8 million voters to back the deal in a referendum in the coming weeks. Governments in Skopje have sought EU and NATO entry for two decades, seeing these as essential to the country’s long-term survival. Greece has held a power of veto over both, and wielded it at the 2008 NATO summit in Bucharest. Armed with a yes vote, Zaev would go to parliament this autumn to seek the two thirds majority needed to alter the constitution in line with the agreement. This would involve more than changing the constitutional name, ‘Republic of Macedonia’. Zaev’s socialist government will have to remove references to the “Macedonian people” as an indigenous race, implying ancient heritage. He will also have to remove references to past struggles to unite all Macedonians from Skopje to the Aegean, implying irredentist claims on Greek territory. By the end of the year, Greece would ratify the agreement in parliament, and lift its veto on the country’s entry into the European Union and NATO. Official entry would happen well ahead of elections scheduled for the autumn of 2019 in both countries. For the Greek side, cultural issues have been paramount. 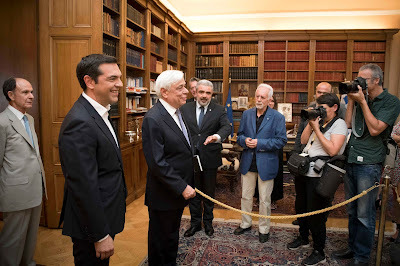 The agreement will force Skopje to abjure any claims on Greek history and heritage, which could imply territorial claims on its northern regions. That means the people of its northern neighbour will be known as Macedonians from Severna Macedonia, softening claims to a Macedonian ethnicity with ancient roots. A committee will be formed to revise school textbooks accordingly, Kotzias said. Kammenos leads the nationalist Independent Greeks party, or ANEL, which is a junior coalition partner to the ruling Syriza. He and his eight MPs will not vote for ratification in Greek parliament, he says, leaving the government shy of the outright majority it will need. Kotzias has said that the government is able to secure the votes necessary without ANEL. Greece invested in NATO and EU membership to safeguard its own security during the Cold War, when it was surrounded by a thousand kilometres of Iron Curtain. It sees the expansion of both bodies in the Western Balkans as the completion of a jigsaw puzzle. Kotzias has embarked on a charm offensive to close the book on old disputes with Albania and former Yugoslav Macedonia, seeking instead to cultivate friendship and common positions. The “Socialist Republic of Macedonia” held its first post-Yugoslav election in November 1990. The VMRO-DPMNE won on a platform of uniting all Macedonians in Macedonian lands under occupation in neighbouring Bulgaria, Greece and Albania into a Macedonian confederation, which would seek EU membership. Greece watched with alarm as, on 25 January 1991 the parliament in Skopje declared “sovereignty of the Socialist Republic of Macedonia” and the “right of the Macedonian people to self-determination”. On 8 September 1991, 72 percent of the former Yugoslav republic’s citizens voted yes in a referendum on the question: “Do you support a sovereign and independent state of Macedonia, with the right to enter into a future union with the other sovereign states of Yugoslavia?” That same month, parliament declared independence from Yugoslavia, and adopted its constitution two months later. In December, following pressure from Germany, the European Union declared it would recognise the former Yugoslav republics as individual sovereigns, precipitating the federation’s breakup. Greece opposed the move but acquiesced following US assurances that it would receive diplomatic support on the Macedonia issue. Greek nationalism was fanned by populists such as foreign minister Antonis Samaras. A rally in February 1992 gathered a million people in the northern city of Thessaloniki. In July 1992, seeing that Greece effectively blocked the path to NATO and EU membership, the president of former Yugoslav Macedonia, Kiro Gligorov, changed tack and applied for recognition at the UN. This caught Greece unprepared and created a two-track process Greece did not immediately address. Meanwhile the deepening and broadening of the war in Yugoslavia added to European concerns that hostilities could extend to the south of the country if central government authority in Skopje were not quickly reinforced. In a final attempt to turn the tables, the socialist government of Andreas Papandreou placed an embargo on Skopje in 1994, excluding food and medicines. Subsequent studies showed that this was largely ineffective, as Greek exporters sent shipments through Bulgaria rather than lose business. It also backfired, isolating Greece diplomatically. Skopje now reaped a flurry of recognitions either as the Former Yugoslav Republic of Macedonia, its official name in the UN, or as Republic of Macedonia. In September 1995 Athens admitted defeat and with signed the Interim Accord with Skopje, whereby Athens and Skopje recognised each other’s sovereignty, disavowed any mutual territorial threat, resumed trade and pledged to find a solution to the name issue. This is the bilateral document that has governed relations between the two nations until now.